Not all camping sites feature bodies of water that allows you to take a bath. And of course, everyone would appreciate some privacy when showering and changing. These shower tents will make it comfortable when camping. 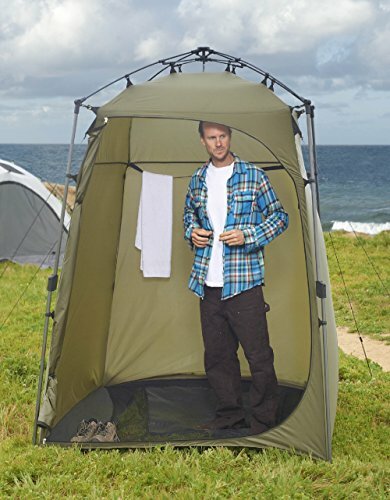 When changing or using the toilet, a quality shower tent is essential. We’ve searched the market and listed down the top 10 best shower tents for this kind of purpose. Here are the following portable privacy shelters that you should check out. It can make your camping experience more enjoyable and comfortable. 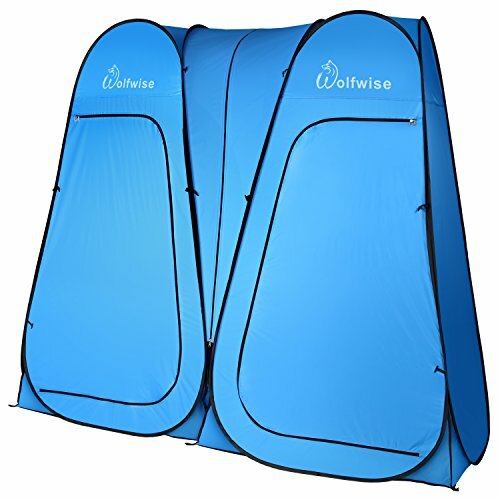 This wolfwise portable shower tent is easy to set up. The collapsible shelter can be opened in just a few seconds that will give you a private place where you can change your clothes, take a shower, or use the restroom. Ideal for hiking, camping, and beach trips, this tent is lightweight and portable. The material is coated to block the harmful rays of the sun. Simply close the large zippered door for additional coverage, and you can do your business. The 11-pound tent can be folded flat, making it an ideal choice for travelers. It also includes a carrying bag for portability. The mesh roof vents provide excellent air circulation inside the tent. There is an integrated clothesline that allows you to hang your wet clothes and store small objects while you are using the shelter. KingCamp is known for manufacturing quality camping equipment, and this product is not an exception. Check out this multi-purpose tent that can act as a changing room, a camp restroom, shower tent, portable toilet tent, and camping privacy shelter. 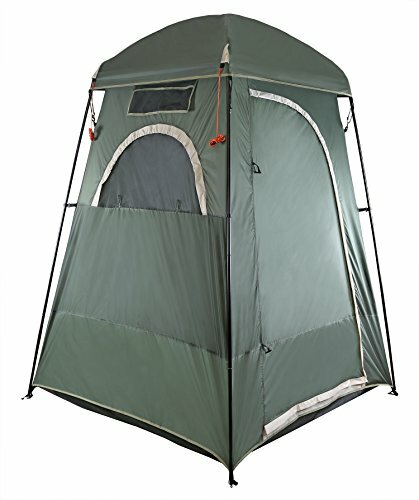 Thanks to its large size, this tent can accommodate two adults at a time. It’s surprisingly lightweight despite its large size, making it an ideal option for traveling and non-stop camping. It comes with a carrying bag so that it’s easier to carry around. This tent is free standing with fiberglass poles, and its sturdy construction can assure you that this tent will last for a long time. Ropes and pegs are included for extra strength; in case you are planning to hang a water bag. There are four compartments for your stuff and a single inside pocket, one outside pocket and two compartments to keep your clothes and towel dry. It also provides great ventilation thanks to its sizeable zippered entry door. It’s easy to access, and the two mesh side windows keep this privacy shelter a lot more comfortable. 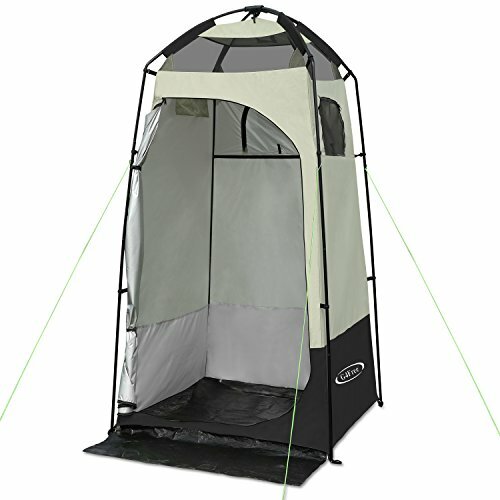 For customers on a budget, we recommend this portable shower tent from Lightspeed outdoors. This compression hub is quick to set up with pre-threaded telescoping poles. It features a large dual zippered D-shaped door for easy access. The fabric is umbrella rated 800 mm PU-coated for wet weather. This can serve as your changing room, camp restroom, camp shower, or storage. You can clip down the floor up and down depending on what you need. There are towel straps, amenities pockets, and shelves for a solar shower or clean clothes that you might place. On the rooftop are two zippered mesh rooftop window to keep the place well-ventilated and breathable. A carrying bag is included making the product an ideal choice for those who travel a lot. The outdoor privacy shelter tent from G4Free features a frame-adoption of anti-rust painting technology. The pole sections are strung together with strong wire, and others are elastic cords. The ferric frame is also sturdy, and it’s enough to let you hold up to four gallons of shower bag compared to other items we’ve reviewed. This private room also features a strap outside of the window in keeping your towel and clothes dry while you shower inside without having to step outside. Its special silver inner coating protects from the sun, and it’s also an anti-light cover. There are eight metallic stakes and four wind ropes for stronger stability, especially if you’re planning to use it on the beach. The abrasion-proof Velcro floor design will keep your feet from getting wet and dirty when showering inside. 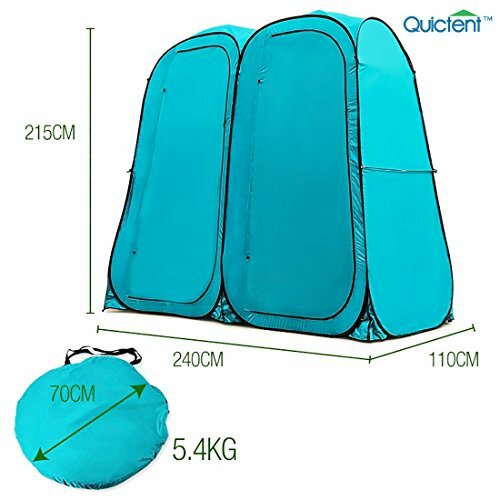 Check out the Quicktent two-room shower tent. This excellent dressing shelter is easy to set up and take down within five minutes only. No tools are required. It features a super thick canvas that’s waterproof and protected with silver coat anti UV oxford fabric. Compared to other materials that you can find in the market, it’s eco-friendly and more portable. We also liked how the manufacturer improved the thickness of their poles for the stronger stability of the dressing shelter. The fiberglass frame has a higher strength compared to other products, making it an ideal choice if you plan to use it in a snow mountain or the beach. Better toughness improved abrasion resistance, and much stable compared to steel poles. Despite the thick frame and fabric, it’s portable and easy to carry around. The package includes a carry bag for easy transport. 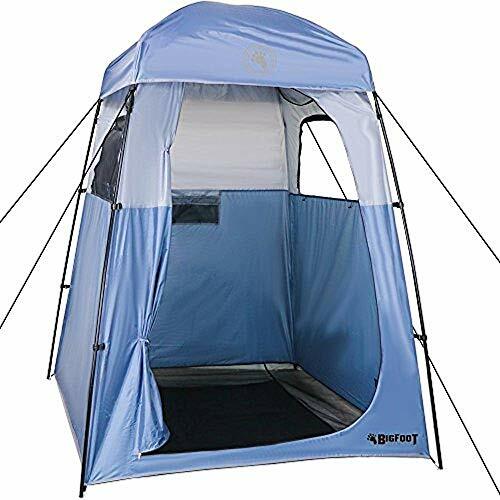 This spacious shower tent is designed for family use due to its large size. It can serve as your changing room. Communal shower tent, and WC. Thanks to its over seven feet of head clearance and multiple storage compartments, changing clothes have never been easier with this tent. The ceiling hooks fit most solar showers, so there’s no problem with the installation of one. The framework is made of fiberglass for stronger stability when using the shower tent on the beach. Its cover is made of shell material 190T Polyester Taffeta. There are also upright poles and waterproof index 2000mm for maximum usage. Camping has never been more enjoyable with this shower tent! The Stansport Cabana privacy shelter is made of polyester and designed to withstand rain and extreme sunlight. 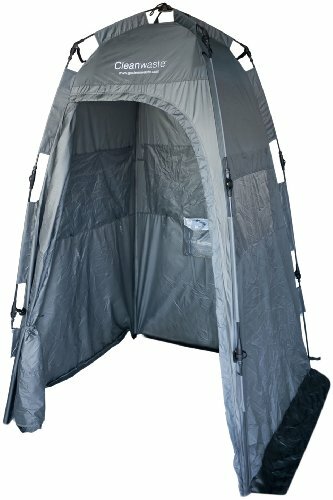 You can use this shower tent for changing, porta potty, or showering. Two U-shaped windows allow you to access your towels outside without difficulty. Also, its durable 190 D nylon and patented G-3 fiberglass poles provide stronger durability compared to other products. The D-shaped door provides easy access to the campers. There is a mesh storage pocket inside for your belongings while you are changing. The package includes a stuff bag to make it easier to carry around. It’s easy to set up. Within five-minute time, you can have your privacy shelter ready to use. 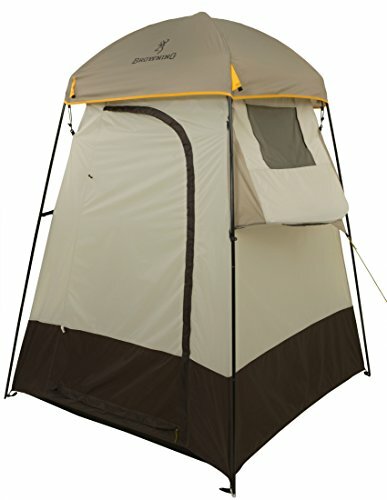 For campers, travelers, and mountaineers, this is an ideal shower tent for you. If you are willing to spend a few more dollars, then we recommend this Cleanwaste go anywhere privacy shelter. Its quick-deploy set-up allows you to assemble the tent within minutes using its snap poles and hinges. Afterward, the tent is ready to use for everyone. It’s also roomy and can accommodate two adults at a time. A zippered privacy door and floorless base for sanitation make it an ideal choice for camping and mountaineering. There are three screened windows in this shelter camp for cross ventilation. The sealable upper-access slap allows for a solar shower to be installed. There is also a nylon mesh storage pockets that can hold supplies, waste kits, towels, and other valuable items while you are changing. Designed with three ground flaps attached to the tent wall, this shelter will withstand even strong winds. 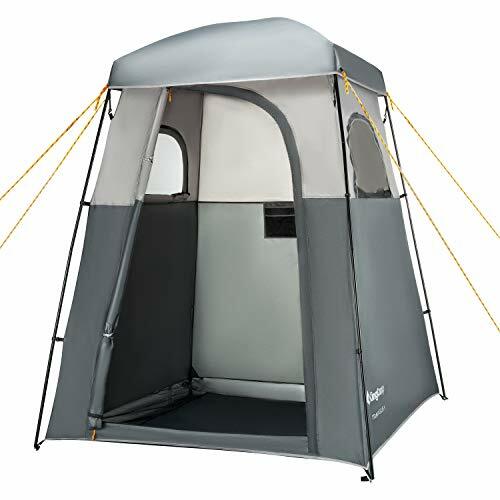 Another budget-friendly shower tent is from Browning Camping. It’s easy to set up, and its free-standing design with fiberglass poles and upright steel poles provides extra support during windy days. There are side shelves and mesh storage pockets located inside to keep your personal belongings while you are showering or changing. The mesh roof vents will keep the shower tent breathable. The retractable floor design also helps you to keep the shelter clean, especially if you are showering. This well-ventilated shower tent only weighs 14 pounds, allowing you to carry it anywhere you want. Its spacious design can accommodate tall persons inside and provides a whole new level of comfort. 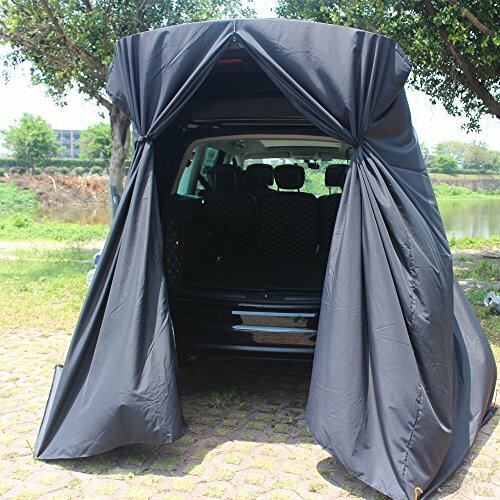 If you like to attach your shower tent to your SUV, we recommend the tailgate shelter tent from MC & SA. This dressing room works with SUV tailgates as changing room for camping, swimming, biking, and other outdoor activities. Because of its design, you have a lot of room to move around and get your things from the car directly. Attaching to the car with belt and suction cups is easy. There are tent pegs on the ground to keep it steady. This shower tent is also waterproof and lightweight. You can carry it around and can be folded in a compact size that fits a small bag.